How do I remove a background? /Design Tools - Backgrounds /How do I remove a background? To remove a background, follow the steps below. Find the “Backgrounds” tab located on the left side of the Design Center — it’s the second icon down. The Backgrounds toolbar will appear, showing two tabs: Solid Color and Image Backgrounds. Click the Image Backgrounds tab. At the top will be any backgrounds currently in the design. Right underneath this is a link that says “Remove Background”. 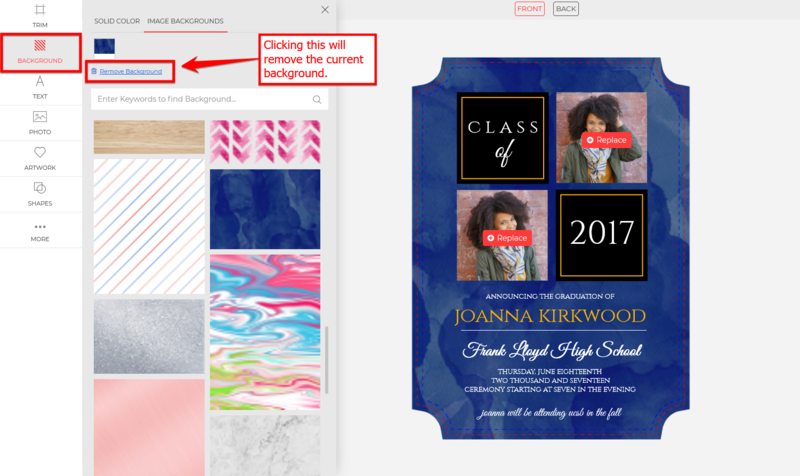 This will remove the background from the side of the design that is currently selected (front or back). If you want to remove the background on the other side of the card, make sure to hit the Back button at the top of the Design Center. *Note* Not everything acting as a background is necessarily a ‘background’. We will often use embellishments as part of the background. If this is the case in your design, embellishments can be removed by clicking and hitting the delete key on your keyboard, backspace, or the trashcan icon to the right in the design center. How do I add a background? Can I just make the background be a solid color? Can I make the background color match a blue dress from my photo? Does the background I choose apply to both the front and back of the card?